Temperature dropped down to 19C and some drizzle (!!!) so it was the ideal setting for my long(est) Tempo Run: 12k (7,5Miles). Also I felt very important to gradually increase the length of the tempo run because they really show the improvement of your aerobic condition. A usual 20/25 mins effort involves pushing hard from the start and does not give a real indication of how fast the HR would drift from the ideal LT training zone to the "over the top" area. While running at least 35 min let you settle into a good speed and observe the feed-back from the heart and legs more carefully. Ideally, you must rise gradually into your LT training zone (for me 170 to 180 bpm) and stay comfortably in that area. It all went very well ... I was running very easy and I avoided on purpose to push more than the target pace, even if the HR was still not in the target zone for LT training until Km8. At the end, I totaled a 43'12" that is a very fine 3'36" pace very steady and easy. Still have stamina to push the last 2k into the 3'2x' area. Could I have gone faster ? I guess that hitting earlier the 170bpm and than rising to 175/177 I could have been more in the 3'32" range ... but "train not strain" seems a good idea in this phase. to close, I post also the HR curve (included speed and cadence) because it is really a nice graph!! Only who has been in China long enough knows that in general, the attention given to the well-being of citizen is much much less of what is given to economic development, money or face or "looking good". everything was so typically Chinese that my colleagues understood my feeling straight away ... "the grass is taken care more than our lives" was a good comment. 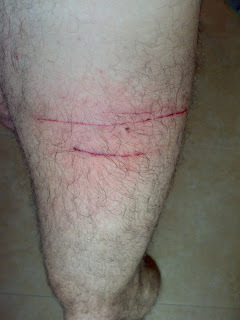 Anyway ... this is my left leg after after the accident. Other cuts are in the right tight and right/left tibia .. I was very determined to make a good long run Sunday, with 5x4k at MP in order to see how easily I could handle the 3'45" pace targeted for the Marathon. the video comes from website www.chasingkimbia.com . The site is a sort of blog about the daily life/training of a group of Kenians based in Boulder. Also the top runners suffers in those long runs ... marathon training is really a tough life. the 2 days of slow run did have an effect !! this morning I headed for one of those "tune-up" sessions for which we are usually very "anxious" because they give you a clear feed-back if the training plan is going in the right direction. Personally I still did not devise a good "signature" workout that could give me an assessment of my form in a comparative manner (during the yearly plan) ... I generally monitor the HR in some key workouts and relate it to my actual speed. So a MP run gives usually a good indication of your aerobic form, since it does not involve that kind of exertion or effort that sometimes is influenced by poor recovery, temperature or else. to cut short, I did a 2x4000m @ targeted MP (3'45"-3"50") with 2'30" recovery jog and later open the afterburner for 2x2000m @ LT effort. The MP effort went very well because i barely entered in the HR typical of MP (for me, from 165 to 170). First 4k at 158bpm, 2nd at 164bpm. This gives me a good indication that at that pace I can easily handle the first 25k (hehehe.... after 25k , you are never sure until race day). - I will start a poll, about what is your "test workout"
Yesterday I throw my heart into a 2nd long run in 5 days. Actually this was a regular Sunday's long run while last Tuesday's one was to recover the missing one during the week-end. I felt quite good, but lack of "sprinting legs" . At steady pace of 4'15" I was fine, but I inserted sections at MP pace (3'45") and I was feeling heavy legs. the week has been very hammering on my legs and to say it plain .. I have now dead legs. But at least I feel confident that both distance and speed are up to the requirement and it is now time to sharpen the training. With this run I close the 2nd phase of the training plan: "LT and endurance build up" and move in the finale phase of "specific endurance". From now on, only 2 serious workout per week, while all the other would be easy run. It is important to have good feelings during the final phase and be fresh for each workout so that you can actually perform well during training. Weather is getting "chilly" (21C in early morning) and I felt quite good, so I decided to stick to my original plan of a 10k Tempo Run, even if my conditions earlier in the week were to be classified as "deadly tired". At the end, It was a 36'24" (3'38" pace) with an average HR of 175. The HR went over 170 only after 2k and I always lift the throttle when it was surpassing 180, so I had only few spikes at 180 in the slightly uphill section of my 3,95Km loop (the usual one around People's Hospital and Residential Area). This week I will therefore do 3 serious workouts, but there is around a very sounding philosophy of making only 2 Big Workouts in the sharpening phase of Marathon build up. Give a look at the website www.therunzone.com I like it very much and coach Tinman is very wise in his suggestions. So probably for this week I will overdo a little but from next week, I will stick to the "2 Big Workouts" philosophy, with a Long Run (with variations) + a TempoRun/Interval/marathon pace or similar. Another thoughts was about the Polar Rs800sd calibration ... all my pace/effort was based on hoping the Polar was well calibrated. There are several websites speaking about the calibration of the Polar footpod, but at the end of the day, even with a perfect calibration you have a 1% error, that makes around 2 sec/km at that speed (not little, I believe). Also the issue of the calibration is basically unsolvable: I used the NB RC600 lightrainer shoe this morning, and my calibration was done several months ago in fairly accurate way. But my stride perhaps is changed a little and this affect also the calibration factor. And do not forget that the calibration is also affected by the actual speed so basically you should have a array of calibration factors based on the shoe and the speed of the training ...!!! Said that, I am considering to buy a Garmin Forerunner... at least I would be 100% of the average speed and distance (even if also the Garmin has his share of weak point). Lastly .. the name "People's Hospital" for public hospitals in China is really misleading ... because basically patients have to pay everything. There is a very limited social security system with medical insurance, but cover only local residents and also it is common for hospital asking extra-money to boost their income, plus the awful habit of local doctors to ask for bribes to take seriously care of patients. I was not at my best and the Polar HRM did not help either: it was not working properly and my HR was showing 195bpm at 4'30" pace... I also got the impression that pace measuring was also troubled... so I forgot about the HRM/pace monitoring and just run on sensation, with a chilly wind from North making my usual 4k loop a bit harder. than headed to the school track and did a 4k @3'50" pace but I was a bit heavy. Did someone have other experiences with Long Run at Mixed pace ? this Saturday was the last race of the 5K series in Hong Kong. - With 1 km to go, I was glued to Mr M and we were approaching to the race leader. I was obviously working hard, but the legs were still fresh. We eventually caught him with 500m to go. - With probably 300m/400m to go, I made a terrific kick and no one was responding. I was not sure of the distance left (the course is very winding and narrow) so I pushed the gas until the final 5meters. - the key to strong performance is always a good aerobic training: aerobic base and aerobic power. This gives you the power to race 5k strong from start to end. - it is not always necessary to train very fast to make a fast time. I kept a 3'10"/km pace (5'12"/Mile) without having made any single workout of fast intervals. Probably I never went faster than 3'20" in training (unless strides). Who on earth would accompany you in a long run consisting of 5 loops around an industrial area in Dongguan, at 5am ???????? So I resigned myself to keeping a regular pace, keeping an eye to the HRM: HR in the range 70/80% of HRmax. The laps went smooth around 16'30" each (each lap is 3,90km). I was a bit tired from lack of sleep, but still paced consistently. For the final, I headed to my usual school track, where I struggled a little to keep the targeted 3'50" pace. Total for the day: 31km and run back by 7.10 (shall I change the blog title) ? just back home from a short holiday in Thailand. I lost 4/5 days of training out of 8 days, so not very good. I made some short runs over there. it was really hot and humid, even at dawn. But it was very interesting to take those secondary roads and see the thai villages from close range. Different from Hong Kong and China, the dogs were very peaceful and did not bother about my presence. 7 x 1000m in 3'25" recovery: 2'00" (200m jog). Heart rate around 175/180, drop back to 120 in the recovery.